1885: he made his first appearance on stage, in Tôkyô at the Chitoseza, where he performed under his real name Kataoka Tôkichi. 16 April 1895: his father Kataoka Nizaemon X died. January 1896: Kataoka Tôkichi took the name of Kataoka Tsuchinosuke II at the Kabukiza, performing in the drama "Zôhô Momoyama Monogatari". 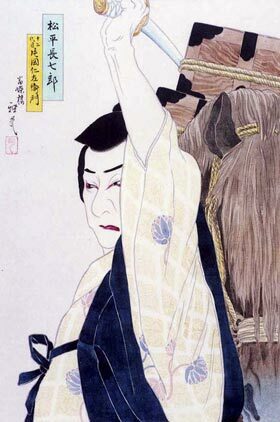 March 1901: Kataoka Tsuchinosuke II took the name of Kataoka Gadô IV in Ôsaka at the Kadoza, performing in the classic "Imoseyama Onna Teikin". July 1903: Gadô played at the Bentenza (Ôsaka) the role of Shuntokumaru in the drama "Sesshû Gappô-ga-Tsuji"; his stage partners were Arashi Tokusaburô V (Tamate Gozen) and Arashi Kitsusaburô IV (Gappô). April 1912: premiere at the Kabukiza of the dance "Hashi Benkei"; Gadô played the role of Ushiwakamaru [more details]. January 1916: Gadô played at the Naniwaza (Ôsaka) the prestigious role of Princess Yuki in the drama "Kinkakuji"; his stage partners were Arashi Tokusaburô V (Tôkichi) and Arashi Ganshô (Daizen). The same play is staged with the same casting in April at the Suehiroza (Nagoya). September 1922: revival at the Meijiza of Tsuruya Nanboku IV's drama "Nazo no Obi Chotto Tokubê"; Gadô played the role of the okujochû Kotoura [more details]. April 1932: premiere at the Kabukiza of Mayama Seika's "Yoritomo no Shi"; Gadô played the role of Ôe Hiromoto [casting]. 16 October 1934: his uncle Kataoka Nizaemon XI died. December 1934: Gadô played at the Minamiza the role of Shinbê in the drama "Sukeroku Yukari no Edo Zakura"; the roles of Sukeroku, Agemaki and Ikyû were played by Ichimura Uzaemon XV, Nakamura Fukusuke IV and Matsumoto Kôshirô VII. Gadô also played the role of Yoshitsune in the dance-drama "Kanjinchô"; the roles of Benkei and Togashi were played by Matsumoto Kôshirô VII and Ichimura Uzaemon XV. January 1936: Kataoka Gadô IV took the name of Kataoka Nizaemon XII at the Kabukiza, playing the roles of Matsudaira Chôshichirô and the courtesan Satsuki in the dramas "Sanzenryô Hatsuharu Kurairi" and "Hototogisu Tateshi no Goshozome"; the roles of Gosho no Gorozô, the courtesan Ôshû, Hoshikage Doemon and Kabutoya Yogorô in the latter drama were played by Ichimura Uzaemon XV, Ichimura Kakitsu VII, Matsumoto Kôshirô VII and Onoe Kikugorô VI. December 1937: Nizaemon played at the Minamiza the role of Yoshitsune in the dance-drama "Kanjinchô"; the roles of Benkei and Togashi were played by Matsumoto Kôshirô VII and Ichimura Uzaemon XV. March 1938: Nizaemon played at the Ôsaka Kabukiza the role of Agemaki in the drama "Sukeroku Yukari no Edo Zakura"; the roles of Sukeroku, Shinbê and Ikyû were played by Ichimura Uzaemon XV, Nakamura Kaisha and Ôtani Tomoemon VI. Nizaemon also played the role of Yoshitsune in the dance-drama "Kanjinchô"; the roles of Benkei and Togashi were played by Matsumoto Kôshirô VII and Ichimura Uzaemon XV. November 1938: premiere at the Kabukiza of "Nambuzaka no Yuki Wakare", the sixth play of Mayama Seika's cycle "Genroku Chûshingura"; Nizaemon played the role of Lady Yôzeiin [casting]. January 1940: premiere at the Tôkyô Gekijô of "Ohama Goten Tsunatoyo-kyô", the fifth play of Mayama Seika's cycle "Genroku Chûshingura"; Nizaemon played the role of Ejima [casting]. March 1941: Nizaemon played at the Kabukiza the role of Yoshitsune in the dance-drama "Kanjinchô"; the roles of Benkei and Togashi were played by Matsumoto Kôshirô VII and Ichimura Uzaemon XV. December 1941: Nizaemon played at the Minamiza the role of Otomi in the drama "Yowa Nasaka Ukina no Yokogushi"; the role of Yosaburô was played by Ichimura Uzaemon XV. He also played the role of Yoshitsune in the dance-drama "Kanjinchô"; the roles of Benkei and Togashi were played by Matsumoto Kôshirô VII and Ichimura Uzaemon XV. June 1943: Nizaemon achieved a great success at the Kabukiza by playing the role of Kiso Senjô Yoshikata in the drama "Yoshikata Saigo". December 1945: Nizaemon played at the Tôkyô Gekijô the roles of Rôben, Akoya and Omino in the dramas "Rôben Sugi no Yurai", "Akoya" and "Sasaki Takatsuna". January 1946: Nizaemon appeared on stage for the last time, in Kyôto at the Minamiza, where he played the roles of Matsudaira Chôshichirô, Benten Kozô Kikunosuke, Akoya and Sakaida Kakiemon in the dramas "Matsudaira Chôshichirô", "Benten Kozô", "Akoya" and "Meikô Kakiemon". 16 March 1946: "his life and career were cut short, however, when, on 16 March 1946, he and four others in his household were murdered by Toshiaki Iida, in the actor's home . Iida was a writer who had been living in a detached house on the actor's property. Like the great majority of Japanese in the early post-war, Iida was extremely poor and starving. On this particular day, a quarrel erupted between Nizaemon and Iida who envied and resented the actor's relatively lavish lifestyle; it ended with the writer killing Nizaemon, his wife, his infant son, and two maids with a hatchet" (source: wikipedia). Kataoka Nizaemon XII was the first in this prestigious line of actor to focus on onnagata roles. After the death of Onoe Baikô VI in 1934, he became the main stage partner in female roles of the star Ichimura Uzaemon XV. He was extremely popular in Tôkyô as well as Ôsaka. Kataoka Nizaemon XII's best roles: Miyuki ("Asagao Nikki") and Akoya ("Dan no Ura Kabuto Gunki"). Kataoka Nizaemon XII's home in Tôkyô was located in Sendagaya (district of Shibuya). The victims were the actor, the actor's 26-year old wife Toshiko, his 2-year old son Saburô, a 12-year old housemaid and a 69-year old housemaid.